Blanket bog. Bleak and wild, the cotton grass dotted blanket bog landscape stretches out to the horizons of the South Pennine moors in the west of Barnsley. Formed on waterlogged ground where peat has accumulated in depth over thousands of years, blanket bog supports a special array of wildlife, including golden plover, dunlin, curlew, common lizard and mountain hare. Blanket bog has formed in the upland areas of heavy rainfall where the ground becomes waterlogged and plant remains have accumulated as deep peat. Most peat formation began 5000-6000 years ago, it is thought partly due to woodland clearance, and is largely made up of the remains of cotton grass and sphagnum mosses. The resulting very wet, acidic and nutrient-poor conditions mainly suit a limited range of plants: mosses, cottongrass, rushes and grasses; peaty pools, and drier hummocks of Heather, Bilberry and Crowberry. However there are a number of unusual plants adapted to this specialised habitat, including sphagnum mosses, Bog Asphodel, Cranberry and the Round-leaved Sundew. Blanket bog is a local priority habitat because of its particular national status, the species it supports and the potential for its restoration and conservation. Blanket bog is a UK BAP priority habitat and Section 41 habitat of principal importance. It is found mainly above the 400 metre contour on Barnsley’s upland moors where it covers 2164 ha. Phase 1 habitat surveys list it as bog. 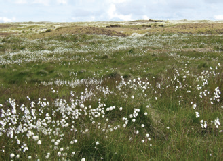 Blanket bog is strongly dominated by cotton grass and mosses. It is distinguished from heath by its occurrence on deep peat (>0.5 m) and by having less than 25% heather-like dwarf shrubs. Other communities, such as flush, fen and swamp types,also form an integral part of the blanket bog landscape. Features of blanket bog supporting wildlife species. Blanket bogs do not support a large diversity of priority or other species, but are important for the species they do support. Together with the lower, linked heather moorland, blanket bog is of great importance for breeding Golden Plover and Dunlin. Red Grouse, Curlew, and Snipe can also utilise these habitats, as well as, more rarely, Merlin and Short-eared Owl. Common lizard and Mountain Hare also frequent blanket bog, and there is a wide range of invertebrates which are an important food source for moorland birds. Damaged and degraded bogs may be dominated by heather Calluna vulgaris or purple moor grass Molinia caerulea, and in these situations, typical bog species may be infrequent or absent. Mountain hare, common lizard, dunlin, golden plover, and other species require shelter, provided by hollows, ridges, and the vegetation itself as well as an abundance of invertebrates and/or seeds. A mosaic of vegetation and often the presence of heather is often a benefit for these species. Dunlin breed around bog pools. The more localised and specialist invertebrates and bryophytes are associated only with nutrient-poor sphagnum and sedge-dominated wetlands. They are strongly associated with: permanently wet habitats; sphagnum, shallow pools and low vegetation cover; high water quality; and acid conditions. The flushes on the margins of the bogs can be botanically richer, supporting Bog Asphodel, Sundew and a variety of Sedges. Birds: Golden Plover, Dunlin, Curlew, Red Grouse, Snipe, Merlin and Short-eared Owl. 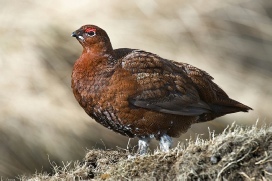 Potential for recolonisation by Black Grouse, Hen Harrier and Twite. Red list: Black Grouse, Hen Harrier and Twite. Amber list: Dunlin, Golden Plover, Curlew, Red Grouse, Merlin, Short-eared owl. The quality of the habitat has suffered significantly, with a decline in species diversity as a result of air pollution, over-grazing, inappropriate or accidental burning, peat extraction and past drainage. Wildfires and air pollution in particular have contributed to the poor condition. At their worst, these impacts have led to substantial areas of eroding moor, seen for example on Langsett Moors. However in part some erosion may be a natural process, reflecting the great age (9,000 years) of the Peak District peats. Conversion to pasture or forestry plantations. Atmospheric pollution depleting the lower plant flora (sulphur dioxide levels have decreased, but nitrous oxides have increased). Recreational disturbance leading to localised vegetation damage and possible disturbance to breeding birds. Climate change and its effects such as infestation of heather beetle due to mild winters and wet springs. Maintaining wet conditions. On sites that are drying, raising the water levels should be considered. Blocking drains to retain rain water will allow the water table to re-stabilise and peat-forming species to colonise areas that have dried or been otherwise affected. Maintain a varied structure: boggy pools, flushes, wet peat, sedge and rush stands, hummocks and tussocks, some dwarf shrubs. Appropriate grazing is the main way of maintaining a mosaic of structure; overgrazing will reduce the structural diversity and species richness of vegetation and the quality of the habitat. Minimise disturbance. Make sure that too much access by the public does not cause damage. Blanket Bogs are part of a UK resource of international importance for nature conservation. It is one of the most extensive semi-natural habitats in the UK, supporting around 10-15% of the world resource. The EC Habitats Directive priority habitat active blanket bog is that still supporting a significant area of vegetation that is normally peat forming. All of the blanket bog in the Peak District is protected within the Dark Peak SSSI which also forms part of the South Pennine Moors SPA designated in recognition of its populations of upland breeding birds - golden plover, merlin and short-eared owl. All the blanket bog outside the SSSI is recognised as a Local Wildlife Site. National policies have a presumption against clearance of blanket bog for other land uses and development. Sites of special scientific interest (SSSIs) are protected by law in order to conserve their habitats and wildlife. The Defra Ecological Impact Assessment (EcIA) Regulations may apply. ???? Activities on blanket bog where protected species are present may involve offences being committed under the Wildlife and Countryside Act, 1981. Protected species include all breeding birds. Licences may be needed from Natural England. Wildlife conservation bodies: give advice and provide practical support in management of blanket bog. Natural England: gives advice on blanket bog management and prevents damage to blanket bog in considering change of use applications. 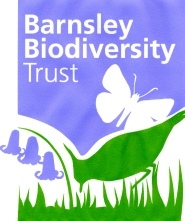 Peak District National Park and Barnsley Council as planning authorities: set conditions in relevant planning applications to ensure that the biodiversity value of blanket bog are maintained and enhanced. Voluntary groups and volunteers: help with blanket bog management; help with information about the condition of blanket bog and provide records of the wildlife in them. Raise awareness of the importance of blanket bog for biodiversity. Review the extent and condition of blanket bog in Barnsley. Promote positive conservation management practice for blanket bog sites in order to bring them into favourable condition. Seek the restoration of blanket bog habitat on areas that have dried out, become poor quality heath, or have been planted over in order to extend blanket bog habitat in favourable condition. Collect and analyse records of populations and assemblages of wildlife species in blanket bog in Barnsley. number of sites of blanket bog in positive conservation management. The criteria for consideration of blanket bog habitat as a Local Wildlife Site are that the sites are over 0.25ha, on a peat substrate >0.5m deep, and have an affinity with National Vegetation Classifications M3, M19, M20 and M25. The best sites will have a good range of notable plants typical of blanket bog or support good populations of key species. JNCC advice on Blanket Bog. Designated sites. Blanket bogs or mires in the Barnsley district are mostly (but not entirely) within the Peak District National Park to the west of the borough and are found in the South Pennines SAC and SPA. Blanket bog habitat in Barnsley is found in the Barnsley sections of the Dark Peak SSSI and the “Barnsley Western Moors” Local Wildlife Site which abuts the SSSI and forms a buffer to it. .